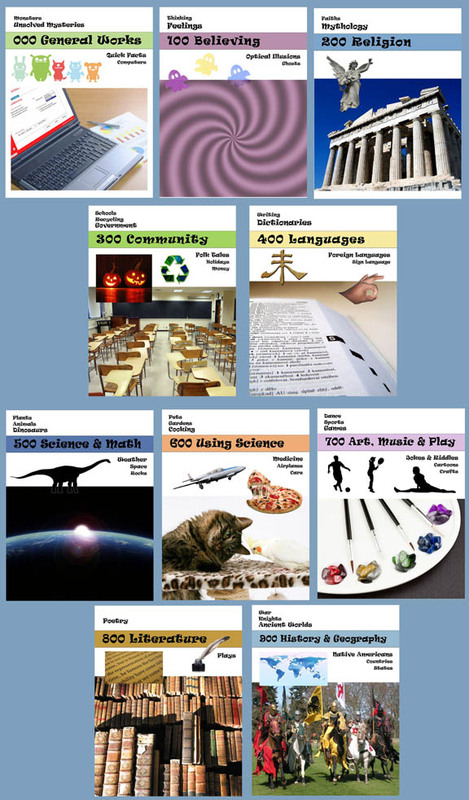 Free Dewey Decimal posters download! Spruce up your classroom or library for the new year! Last year the librarians at my daughter’s elementary school discovered I knew Photoshop. This led to many projects, and this last one was so involved that we decided we would share the results with the entire library and teaching community. What they needed: Modern, fresh-looking, easy-to-read posters on the Dewey Decimal system geared toward elementary school students. So I designed 10 posters using legal, royalty-free photography and the terms that the librarians decided best fit the needs of the kinder-5th grade readers who would use them as reference. They are PDFs designed on an 8 1/2 x 11 page so they are easy to print small and evaulate. We ran ours at 18×24. We got coupons online for Office Depot and ran the whole set of 10 huge color posters on glossy heavy stock for about $100 then laminated them on the school machine. That zip file includes all 10 high-res PDFs. But here is a chart of what the 10 posters look like.